NEW ORLEANS – Yet another American Junior Record fell to Kendell Williams of Georgia at this past weekend’s U.S. Junior Outdoor Championships held this past weekend at Hayward Field in Eugene, Ore., headlining 19 national titles and 37 World Junior Championships qualifying performances by collegians. Crossing the line in the 100-meter hurdles in a 2014 World Junior-leading 12.87 (+2.0m/s), Williams – already the World Junior record holder in the pentathlon indoors and the American Junior Record holder in the heptathlon outdoors, and NCAA Champion in both events—toppled the seven-year-old American Junior Record formerly held by Kristi Castlin since 2007 and moved up to No. 2 on the all-time World Junior performers list. She also ran a wind-aided 12.98 in the prelims. The performance secured her not only a spot in the record books, but also a spot on the Team USA roster for the IAAF World Junior Championships to be held in that very same Hayward Field complex from July 22-27. She will sport the Red, White & Blue alongside at least 36 other collegians who qualified as individuals by finishing among the top two in their respective events this weekend. 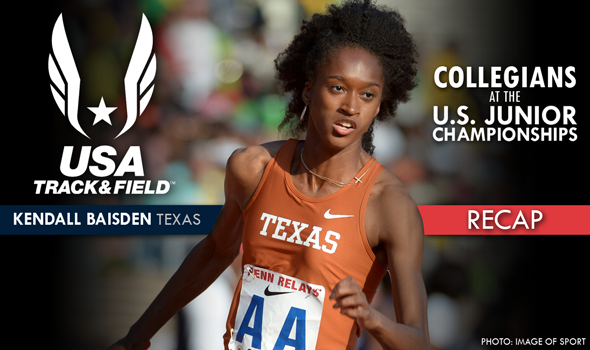 Joining Williams as NCAA Outdoor Champions doubling as U.S. Junior Champions were Baylor’s Trayvon Bromell in the men’s 100 meters, Texas A&M’s Shamier Little in the women’s 400-meter hurdles and Texas’ Kendall Baisden – who was an NCAA Champion in the 4×400 relay – in the women’s 400 meters. Bromell crossed the line first in 10.07 (+1.2m/s) to win by two-tenths of a second, though a false start in the final by Florida State recruit Trentavis Friday averted a showdown between the fastest two Juniors in world history. Bromell’s 9.97 at NCAAs was the fastest ever, while Friday’s 10.00 in the prelims Saturday afternoon was No. 2 all time. Meanwhile over a distance four times as far as Bromell, Little in the 400-meter hurdles had to surge to the line in 55.43 to clip high schooler Sydney McLaughlin in the closing meters by that same two-tenths-of-a-second margin. Baisden outlasted high schooler Olivia Baker to win by a quarter of a second in 52.21. In winning the women’s discus, Stanford’s Valarie Allman further solidified her 2014 World Junior lead with a first-attempt mark of 188-6 (57.45m) to win by nearly 14 feet. All collegians who won national titles in their events are listed below, as are those who finished runners-up to qualify for the World Junior Championships. Video replays of select events, courtesy of Runnerspace.com, can be found by clicking the names of the student-athletes. Still others may be eligible for the 4×100 and 4×400 relay pools, or may otherwise ultimately contest an individual event should one of the top two in their events be unable to compete.